Prominent & Leading Manufacturer and Trader of Exit Signage. As we are one of the top-most organizations, we are engaged in manufacturing and trading a wide array of Exit Signage to fulfill the demands of our customers. A team of skilled workers and qualified technicians manufacture these products. Our clients can buy these products in plentiful sizes in agreement with client’s necessities. Offered Exit Signage are made available in several specifications. 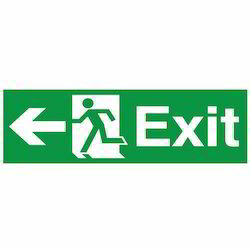 Clients can buy these Exit Signage from us at pocket-friendly prices.